The Gammaproteobacteria comprise several medically and scientifically important groups of bacteria, such as the Enterobacteriaceae, Vibrionaceae, and Pseudomonadaceae. A number of important pathogens belong to this class, e.g. Salmonella spp. 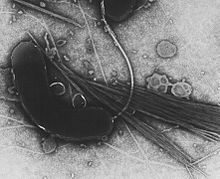 (enteritis and typhoid fever), Yersinia pestis (plague), Vibrio cholerae (cholera), Pseudomonas aeruginosa (lung infections in hospitalized or cystic fibrosis patients), and Escherichia coli (food poisoning). Important plant pathogens such as Xanthomonas axonopodis pv. citri (citrus canker), Pseudomonas syringae pv. actinidiae (kiwifruit Psa outbreak), and Xylella fastidiosa are also Gammaproteobacteria. Members of Chromatium are photosynthetic and oxidize hydrogen sulfide instead of water, producing sulfur as a waste product. Some Gammaproteobacteria are methane oxidizers, and many are symbiotic with geothermic ocean vent-dwelling animals. A number of bacteria have been described as members of Gammaproteobacteria, but have not yet been assigned an order or family. These include bacteria of the genera Alkalimarinus, Alkalimonas, Arenicella, Gallaecimonas, Ignatzschineria, Litorivivens, Marinicella, Methylohalomonas, Methylonatrum, Plasticicumulans, Pseudohongiella, Sedimenticola, Thiohalobacter, Thiohalomonas, Thiohalorhabdus, Thiolapillus, and Wohlfahrtiimonas. ^ Holt JR (6 February 2013). "Description of the Phylum Gammaproteobacteria". Susquehanna University - Systematic Biology Course Website. Retrieved 17 April 2018. ^ Williams, K. P.; Gillespie, J. J.; Sobral, B. W. S.; Nordberg, E. K.; Snyder, E. E.; Shallom, J. M.; Dickerman, A. W. (2010). "Phylogeny of Gammaproteobacteria". Journal of Bacteriology. 192 (9): 2305–2314. doi:10.1128/JB.01480-09. PMC 2863478. PMID 20207755. ^ "Classification of domains and phyla - Hierarchical classification of prokaryotes (bacteria) - Gammaproteobacteria". List of Prokaryotic Names with Standing in Nomenclature. Retrieved 13 January 2017. This page was last edited on 29 March 2019, at 23:26 (UTC).